A spectacular photo like this would make for a great submission to the TFHS contest. For a complete list of annual Secchi depth data since 1968, visit http://terc.ucdavis.edu/research/SecchiData.pdf. 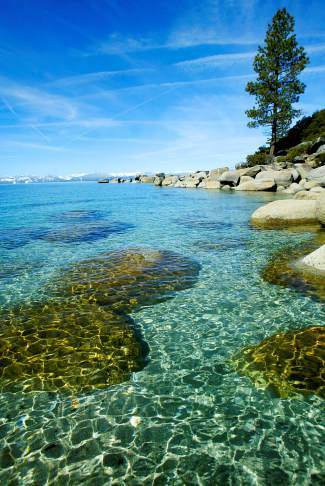 LAKE TAHOE — The mid-lake clarity of Lake Tahoe’s famed blue water declined by about 5 feet last year. The average measurement from 25 clarity readings taken last year was 70.1 feet. That’s down from 75.3 feet in 2012 and short of a clarity restoration target set at 97.4 feet by state and federal regulators. 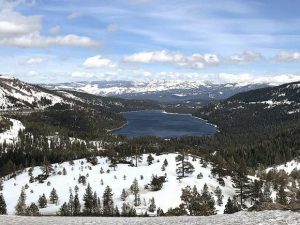 But it represents a continued stabilization in clarity levels after years of declines, according to the Tahoe Regional Planning Agency and Tahoe Environmental Research Center at University of California, Davis. The organizations released their yearly clarity findings on Thursday. Clarity is measured by the depth at which a 10-inch white disk, called a Secchi disk, remains visible when lowered beneath the lake’s surface. Such measurements have been taken since 1968, when the disk was seen to a depth of 102.4 feet. The lowest annual average was 64.1 feet in 1997. Individual clarity readings taken in 2013 ranged from a low of 49 feet to a high of 90 feet. Readings were highest in the winter months, at 77.9 feet. While also down 10 feet year over year, winter clarity averages have been on a steady improvement track since 1997, according to the Tahoe Environmental Research Center. Clarity readings in November and December were significantly higher than in 2012 because of drought conditions. The lack of rain or snow means less stormwater and fine sediment reaching the lake. Summer clarity readings in 2013 were nearly identical to 2012 at 63.8 feet, but the persistent trend in those months is one of declining clarity. Schladow said he applauds the launch of a regional stormwater monitoring program for Lake Tahoe, calling it an important achievement that should improve knowledge about the lake and efforts to improve its clarity. Funded with about $1.5 million in grant money, the program started last October with 11 monitoring sites and is expanding to four more sites. 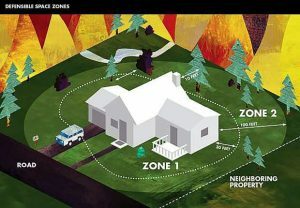 The effort is led by the Tahoe Resource Conservation District. Stormwater monitoring could help determine what types of projects are doing the most to improve Lake Tahoe’s water quality. Another task of the grant is to develop a monitoring model and funding plan that can be sustained into the future. Hundreds of millions of dollars have been spent on erosion control and stormwater improvement projects in the Lake Tahoe Basin in an effort to improve clarity and other water quality measures. Rain and snowmelt picks up fine sediment from roadways and other paved areas and carries it into the lake where it deflects light and reduces clarity. Jesse Patterson, deputy director of the League to Save Lake Tahoe, agreed the clarity decline seen in 2013 fits in that trend of stabilization. “It’s encouraging, but there’s still a lot to be done,” he said. Patterson said a stronger focus needs to be put on Lake Tahoe’s near-shore environment. He supports the regional stormwater monitoring program as a needed next step as well as a recently completed near-shore monitoring framework that was mandated by the California General Assembly but has not been funded. Proposed near-shore monitoring would focus on water clarity, nitrogen and phosphorus levels, algae growth and invasive species in a section of the lake extending from shoreline to a depth of 69 feet or a distance of 350 feet, whichever is greater. More information about environmental factors affecting Lake Tahoe will be included in the 2014 State of the Lake Report, expected this summer. Funding for TERC’s clarity analyses comes from TRPA.